Ever since Nintendo revealed Joker from Persona 5 would be added to Super Smash Bros. Ultimate as a playable DLC fighter, there have been ongoing rumours about the Persona series coming to the Switch. Atlus fueled speculation when it registered multiple domains last December and then confirmed the existence of Persona 5 R – also known as "P5R" – with a teaser trailer and official website launch in December. What do you think about this rumour? Do you think the latest entry in Persona's mainline series will appear on the Switch in the near future? Tell us below. So PS5 is coming out in fall? That doesn't make sense. Why would a game that's already on PS4 release for PS4? This entire thing is smoke and I don't see a fire. P5R is the "deluxe" game, not sure why he thinks P5S is it... but w/e it's probably the name it'll get on Switch but 5R is already the main game + extra content. @JR150 Historically, Atlus will release an updated version with additional content akin to Game of the Year editions. @JR150 atlus has down this with like every single persona game lol. edit: example Persona 3 and Persona 3 FES are both PS2. Not believing this until Atlus can talk. Atlus has a huge track record of re-releasing games all the time and not just Persona. Catherine, Radiant Historia, Devil Survivor etc. I am hoping we get a mainline Persona game on a Nintendo system. I have P5 for PS3 and loved it. Would buy this day one if it's true. Even so, I'm remaining dubious to keep my hopes down. This series has never touched a Nintendo home console before so I refuse to believe anything. @JR150 The source which predicted the entire previous direct and its date, content, etc...and then went on to predict the Pokemon Gen 8 reveal says that this Persona rumour is true. I think it's more than likely. Totally agree and i'm happy about it. i swear P5 is waaay over hyped im still puzzled as to why Nintendo chose Joker for Smash wasting a spot. I do not care to play P5 again. But if true, we can get more Atlus on Switch. Really would love Cold Steel 3 & 4 on Switch. I get what you're saying for sure since the mainline games have been Sony only for years. But where there's smoke there's fire, time will tell. Of course it is possible and I would love it if it happened. But unlike others, I don't buy a rumor just because someone tweeted it. People guess things all the time, that some people guess right sometimes, doesn't mean they have some secret knowledge. I'm figuring it's coming. Really curious to see what exactly the re-release does differently since it's not been that long since I played it and I do want more, but it's going to need to be heavily tweaked to be worth an immediate investment. Guessing that reveal is also when we'll get a better idea what Joker's Jane costume is exactly. I'm believing this. I just think there's more to Joker being in Smash than advertising Persona Q2 on 3DS. With that said, the Q games prove that Sony doesn't have an exclusive deal with Persona. With the Vita dead, Atlus has no other handheld to turn to when it comes to releasing their enhanced Persona game. Remember, enhanced ports of P3 and P4 released on the PSP and vita respectively. Only thing getting in the way is Atlus's way of keeping certain franchises exclusive to a certain brand. Though, with Sega owning them outright now, maybe they're gonna put an end to that. The base game is sitting at 20 gb currently on PS4. Accounting for tweaks I think they can get it down to around 15-18gb. Doable and considering Atlus’s success on Nintendo, totally expected. Too bad they couldn’t have released it sooner to fill the AAA void currently plaguing the Switch. It also would have made sense to release it on Switch prior to Joker’s arrival in Smash. Who knows... March direct coming with the announcement of Persona 5 available to play now? Switch can handle this game, if this true, day 1! @Spidey-Scrub The "R" is too vague for that, it could mean "Re-imagined" "Redux" or anything else we'll have to wait until the announcement this month. @Rika_Yoshitake Yeah, if the rumors are true, it sounds like this is gonna be an expansion along the lines of Persona 3: FES. @Torakaka I’m just messing around, it still seems odd that Atlas could potentially release 2 different versions of Persona 5 within a short period of time though, regardless of it being some sort of “definitive edition”, “remix”, or so on. I'd be great (although a bit expected after Joker being revealed in Smash) for Persona 5 to come to Switch, but I'm still hoping for a PC release too. Annnnnnd we're doing this again. I hope it happens, of course, but I can't help but feel Nintendo fans are constantly setting themselves up for disappointment by uncritically regurgitating what every "insider" on the internet says on Twitter. Excited! Makes sense since Joker is coming to smash. Not that the Switch wasn’t worth owning before, but NOW the Switch is worth owning! Quit playing games with my heart! My heart... My heart... I should have known from the start. You can't blame us for hoping though. I'm not fully in the loop, but Tokyo mirage sessions was a persona spinn off so choose it could release as mainline right? Why is ATLUS so hush-hush??? I want SMT V news! If this is true, it would be a good E3 reveal. I'm guessing we wont get another Direct until E3 given it's a little over 3 months away. Before May we will have news... that means a Spring Direct... and... AN ANIMAL CROSSING REVEAL IN IT!!! @LanceSizzLe I actually consider this bad news. If they are releasing Persona 5 this Fall, that probably means SMT V isn't coming out any time soon and that's what I really want. @TheFox I agree 100%...Do we now assume a 2020/2021 release for SMT V? I have got to ask- is this series all that it’s cracked up to be? This genre of game doesn’t really appeal to me it would seem; can someone enlighten me as to what they enjoy about this franchise and if I should give it a go? I rather have Persona 4 Golden on the Switch. Couldn't care less about Persona 5 to be honest. I am always down for some turn base RPG. Bring it on! If it does and you haven't played get it!! Such an amazing game, I'm not big into JRPGs but this has been a blast to play. @Varkster Agreed. I’m guessing Persona 5R will be the equivalent of Persona 4 Golden, plus it’ll include all previously released DLC. I much preferred playing P4G on handheld, so I’m really hoping (and believing) this is kosher. Agreed. Metal Gear game is coming to switch because Snake is in Smash. If it happens people can credit me with having insider knowledge. Would make perfect sense, given P4G on Vita, and obviously the rightful success that is the Switch. @Heavyarms55 True, "a broken clock is right twice a day", as they say. "who previously spoke about Persona 5 R ahead of its reveal"
When did he actually speak about P5R? Before the registration of the domain? Otherwise anyone could have "leaked" that. I bought a PS4 2 weeks ago for Persona 5 and Danganrompa Trilogy, within the first 5 hours Persona 5 became my favourite game to date, (Shenmue had been my original favourite since I played it in 2000) I will buy P5 day 1 on Switch and if they do a collectors edition I will buy that as I missed the OG PS4 one, P5 is an almost perfect JRPG and the best one to date imo. So there will be 3 versions of the game on PS4?! As with all rumour and specualtion, I will just wait and see what happens and keep playing the games that actually exist, and I own, in the meantime. Time to kick some more arse Kratos and Atreus. @KryptoniteKrunch Persona Q is so good, I don't usually like first person dungeon crawlers like Etrian Odyssey but I'm loving PQ, it's probably got more to do with the character and setting being more my liking than the actual gameplay though. That's not a Persona game. It's a Shin Megami Tensei and Fire Emblem crossover. SMT is the parent franchise to Persona but still. Not believing these rumors at all. Day1, fact... Just hope I have enough time to finish it before Pokemon!! Both Persona and Shin Megami Tensei are spin-offs. They're part of the Megami Tensei universe. This makes me a bit giddy inside. I put so much time into persona 4 golden on the vita. Would love this. I do have the game on PS3 and have been contemplating buying on PS4 (as I finally bought the console last month) only to slightly reduce the post battle delay. Also, the Switch’s portability has been such a positive aspect since I moved jobs and is much better for a big RPG like it. I strongly now believe that this will happen. If it doesn’t everyone will wonder just why Joker is in Smash ... the P5 logo was displayed when they revealed the DLC at the Game Awards. Surely they would have displayed the Persona dungeon crawler logo as per the game coming out on 3DS. Surely? I'm pretty sure it's happening. I'm way too lazy to dig my PS3 you and my Xbox doesn't get JRPG goodness, although if FF is successful on it maybe we finally will. @JR150 My Persona-Fanboy friend has let me know that Atlus has a long and stupid history of re-releasing the titles with small revisions. S is expected to basically be the GOTY edition, but with some extra story added into the middle of it for those few players eager to play a 120 hour campaign again just to get to the 5 hours of new content. P5 is a fantastic game but I wouldn't trip over myself to buy a new version of it like, a year or two after the original. Very much up for this game on the Switch, avoided it so far as there's bloody way I can spend 80 hours sat in front of my TV (toddler and job). On the Switch though I could just take my time with it and get through it whilst in bed etc. Of course this is happening. There’s no way Nintendo would’ve chosen Joker for Smash if Persona 5 wasn’t getting ported to Switch. @thesilverbrick Agreed, apart form the chibi version of him that will appear in the final 3DS Persona Q 2 game. Really hope Persona 5 gets ported (perhaps similar to the PS3 version). It's a great game and it'll be a good addition to the Switch line-up if it does come. I'll play it again, but on PS4 probably. Well, definitely. I don't know why I said probably. 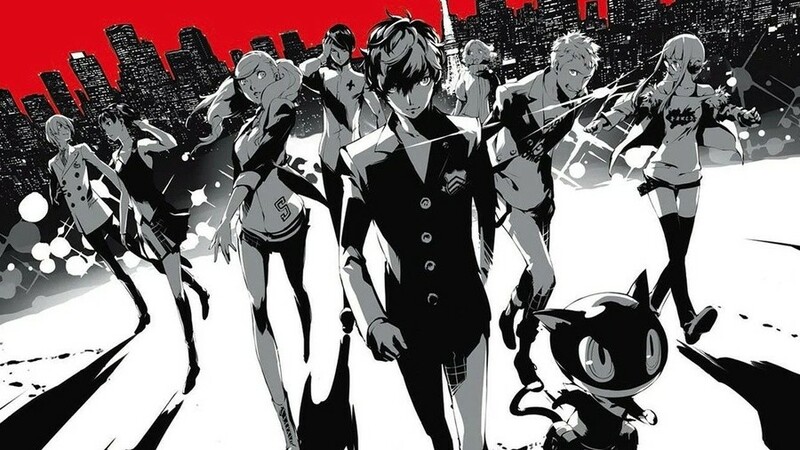 P5R would be great on Switch. I’ve previously played P4G on PSV, and I have P5 on PS4. I traded in P5 on PS3, as P5 on PS4 was a better upgrade to the PS3 P5. I understand that P5R will also come to PS4, but not PS3, although P5R on PS3 would be great to see alongside P5 on PS4 & P5 on PS3 and P5R on Switch. P5R and P5 probably won’t come to PSV, though, since PSV is now unsupported, like PS3. This would be an easy port to Switch. Great game but very simple visuals. Even the PS3 version looks similar to PS4, but blurrier. I cannot imagine Switch version being much different to PS4. Yeah, that game would fit well on the Switch. Will definitively pick it up if it arrives on the Switch. @DrawnRed, this is your calling card my dude. @Bongo_mcnulty I dug out my old PSP to play P3P, which is of course the sublime handheld version of the PS2’s P3. If the PSP is so good with the PS2 P3, and the PSV take on the PS2’s P4 is also so good, then surely the PS3 and PS4’s P5 deserves to rebooted for a handheld in P5S format for the NSW? PS - your post made me laugh. If they could put this on the PS3 then there's no way it wouldn't work on the Switch. @Bongo_mcnulty Too many acronyms, haha. I find this highly believable. I don’t think Nintendo would have arranged for Joker to be in Smash if Persona 5 weren’t coming to Switch. The only counterexample of a third-party Smash character whose main game wasn’t on a Nintendo system was Cloud in Smash 4, assuming it hadn’t yet been decided that FFVII was coming to Switch. Even so, Cloud is a considerably more iconic character in video game history than Joker. My thoughts is likely when they are ready to reveal Joker gameplay or when he releases in Smash then we will get the announcement of Persona 5 S coming to switch. If I've never played a Persona game, is Persona 5 an acceptable entry point? @leo13 it is. It's like with FF, games are mostly not connected to each other. @jcvandan this is exactly why I avoided P5. I initially hoped it would hit PSV but I knew that was a pipe dream. I tried, played P5 briefly, but I just can't devote my time to a game that restricts me to a TV now that I have Switch...not even one as awesome as P5. When/if P5 hits Switch, it will be a day one buy. I got PS5 for under 20 bucks at bestbuy last week. Waiting to crack the seal to see if they announce any news of this for anything earlier than fall. That time belongs to DQ11. Ugh please just announce it. I bought it used for PS4 last Dec; loved the first 4 hours, but sold it the moment I saw Joker for Smash (and rumors). No way I'd finish it on PS4, I can't even sit and finish Horizon and other great games in set couch. But since Dec, I've already finished Dark Souls and Transistor on my Switch. Do it for us! @JR150 It seems to be an expanded edition, like Persona 3 FES, which released on PS2 despite the original also being on PS2. There's really no connecting story. It's a fine starting point. Or at least better than the first two games. @JR150 I forgot about that! Does anyone else think that if SEGA got back into the console business they could be a powerhouse again due to all the great IP they now have. @bwellington id take the Joker from Batman over P5 joker, but jokes aside im happy for people that are fans of P5 im just not one of them; however this kind of shows that next four could almost be anybody. Very nice! I look forward to it! I have to decide between this and dragon quest, i am gonna buy only one. For goodness sake, this has been going on for ages. @SamuraiPanda no Sega would only attract a niche audience and it'd be a waste of resources. They are fine as is.